It’s been some time since I showed the Caps some love over here, and a friend of mine sent me some gorgeous pics of the boys to use, so I thought, “What the hell? These are worthy of some Hump Day Hottie love.” So that brings us up-to-date. 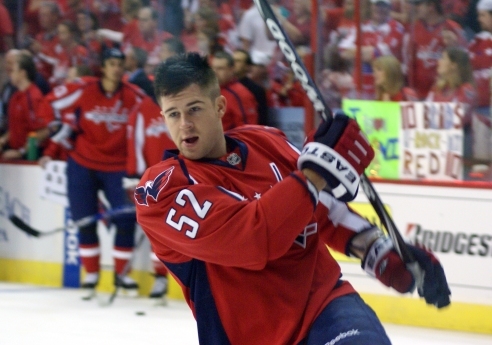 Today I bring you my favorite offensive defenseman and our resident wannabe thug – Mike Green. I’ve shown you his insanely silly website before, but now let me show you some of his hotness. Follow me after the jump for some Mike Green adoration. 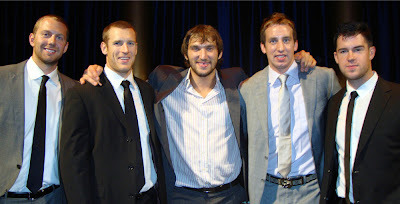 Since I love hockey, it’s only natural that I have a fantasy hockey team. This year I’m playing under the name “I Laich It!” for Brooks Laich. Unfortunately, he doesn’t put up awesome fantasy stats so he’s still on waivers. Anyways, I like to draft players that I like, and I usually like hot players. So as I was perusing my roster and wondering what to post about this week, I thought to myself, “Self…you have a pretty hot roster. Maybe you should share these hot boys with the Ladies… readers.” So that is what I’m doing. So follow me after the jump and check out my hot fantasy team! I promise not to disappoint! More Flags! More Fun! 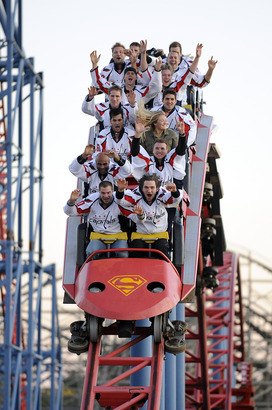 Six Flags with the Caps! This was from last year, but you get the point! So I’m only a few hours removed from one of the coolest nights ever. As most of you already know, I’m a Washington Capitals season ticket holder. One of the perks of being a STH is a party with the team at Six Flags America. Well, last night was the party, and I thought I would share some photos and stories from the event. 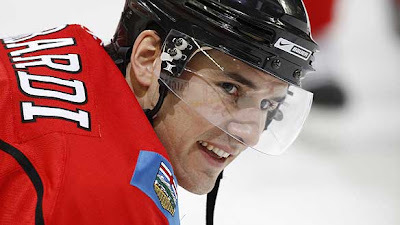 Follow me after the jump for some pictures of some hockey hotties. 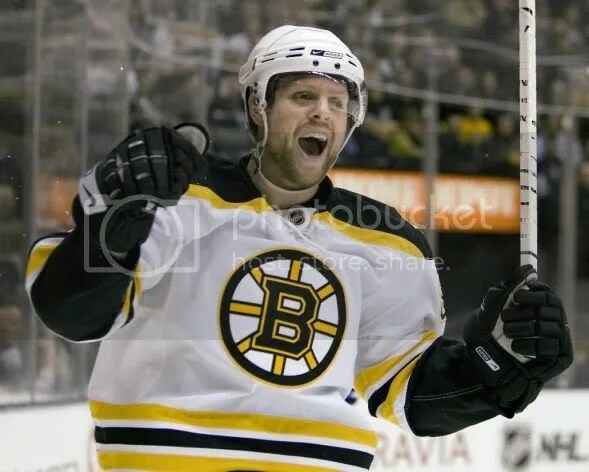 And I promise there is gratuitous Steckel. Ladies, I’ve flashed a few hot pics of Mr. Lombardi before, but I’ve decided he needs his own post. This one actually comes by request from a friend of mine who, while perusing some of my posts, pointed out that Matthew was way hot and should get his own post. So check out more of this man’s hotness after the jump! So none of these guys are after the jump, but I had to include some of my hot Caps in this post. Tomorrow, tomorrow…I love you, tomorrow. You’re only a day away!!! Now that I’ve got that stuck in your head…I can’t wait until tomorrow. NHL regular season gets underway tomorrow!! If you don’t have DirecTV, be sure to check out the double header on Versus starting at 7 EST. Caps vs. Bruins is first, followed by Sharks vs. Avalanche. Now it’s onto the preview of the Southeast Division. Even hockey players watch football to pass the time. 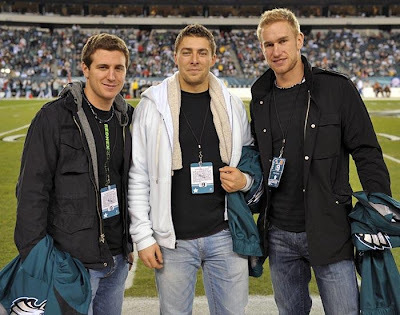 Sadly, you won't be seeing this trio of hotties at any Eagles games anytime soon. As Lady Bee told you yesterday, we here at Ladies… can’t wait for the NHL season to finally start, so we’re doing some previews for those of you who feel our pain! Today I’ll be previewing the Atlantic Division. Phil is happy here, but just wait until November when his Leafs are in 11th place.